All vaccinations are given by our experienced registered nurses, considered the gentlest on the Gold Coast. We stock the recommended vaccinations for Thailand, Vietnam, India, China, South Africa, Africa, Mexico, Turkey, Indonesia, Egypt, Kenya, Cambodia, South American countries and all other overseas destinations you may require travel injections for. Our large inventory of travel vaccines are stocked on-site, so you will not have to source your own vaccine from a chemist. We stock vaccines against diseases which are not common in Australia but are rampant overseas such as rabies, hepatitis A, hepatitis B, typhoid, cholera, yellow fever, Japanese encephalitis, tick-borne encephalitis, influenza, meningococcal disease, measles, mumps and varicella (chickenpox). We also offer protective measures against contracting malaria but there is no vaccine against malaria. Note that some travel vaccines require an immunisation schedule which is a course of 2 or 3 inoculations over a few weeks, so your Health HQ travel health doctor will provide you with a personalised vaccination schedule to make sure you are as well protected as possible before your departure. Subsequent visits for completing vaccination courses are bulk-billed. Feeling squeamish about needles? The registered nurses at the Travel Health Doctors are very experienced at giving injections. Feedback from our satisfied patients suggests the techniques our nurses use make the vaccines almost painfree. However, not every vaccination requires an needle; some are taken by mouth. Every traveller is provided with a detailed vaccination record book explaining what vaccines you have been given and when you may need a booster dose in the future. This vaccine record book will be updated each visit, so you will have all your vaccination information in one safe place. 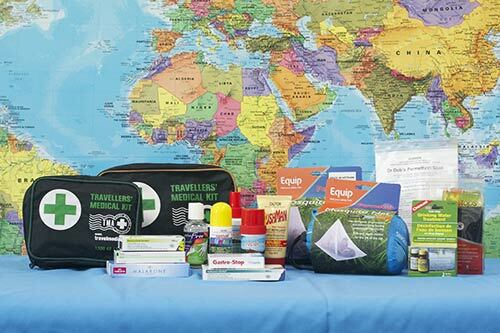 Health HQ has standard medium and small travel first aid kits as well as customised travel medical kits which have travel health products suited to your individual travel destinations.